Maremmas get surrended up to pounds or to rescue for a huge range of reasons. One of the most commno reasons is that people buy a maremma 'on a whim', seeing a cute fluffy puppy in a pet shop, and find that they have taken on something that is totally inappropriate for their actual situation. Pet shops rarely advise prospective customers that maremmas BARK and this is part of their nature. Certainly some maremmas bark more than others, but it is something important to alwasy take into consideration! A responsible breeder will check the details of a prospective owner before accepting them to take one of their pups, but of course pet shops simply want a quick sale and will sell them to anyone. Becky 7yrs, adopted 2012 to companion-working home. Becky was surrendered for being to nervous and did not bond well with her family and barked to much. Very true, sometimes you have to talk people out of having one which is quite exhausting! Of course they bark, it's in their job description! Hi, just wondering if I should correct my maremma when he's barking? He gets a 'silly' bark sometimes & I wonder if I should correct him? He's only 12mths. hi roamnfree, I'm not sure what you mean by a 'silly' bark, though we do get to know our dogs barks as they do use different tones for different purposes. Sometimes it is worth trying to investigate what he is barking at, and if it is something that doesn't seem to you to warrant the noise you can try whispering with him and encouraging him to look or smell without noise. 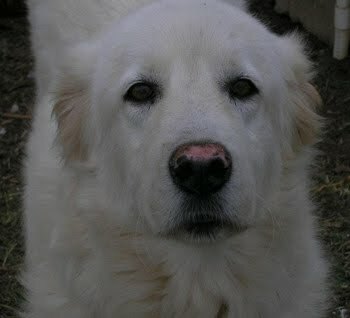 However, having said this - stopping a maremma barking is not an easy task. I had one maremma whilst I was living in town for a few years who did become incessant with barking and I resorted to a bark collar. It upset her a lot, she became quite depressed which dissipated over a few weeks and she actually became a more stable and happy dog!